Diffuse redness of the skin occurs when there is an extensive amount of dilation of the very fine capillaries (very small blood vessels) of the skin. 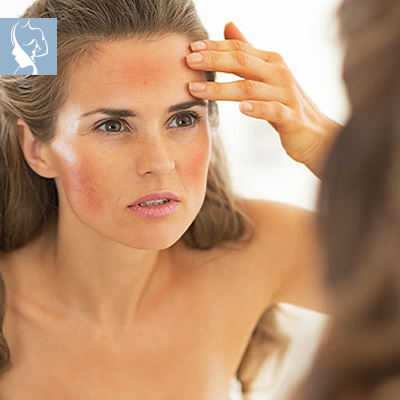 The areas of the face that are most commonly affected are the nose, forehead and cheeks. The blood vessels are dilated or widened and when this occurs, the presentation is that of increased redness of the affected area of the face. There are many tiny red blood vessels under the surface of the skin if they dilate the result is noticeable. It is important to note that while the pigment of the skin gives the skin a certain colour, it is, in fact, the red blood cells in blood vessels that gives skin its overall colour seen most effectively in Caucasian skin tones. Diffuse redness on the face can occur as a result of excessive exposure to the sun and is also seen as part of the natural ageing process as well in pregnancy, from the use of oral contraceptives. Lifestyle habits such as cigarette smoking and alcohol consumption may also play a role like heredity to a lesser or greater extent. Diffuse redness is most often seen in individuals between the ages of 18 and 40 and this condition affects women more than men. As we age the condition may worsen. Laser treatments are highly effective and are a minimally invasive treatment option for reducing the appearance of diffuse redness. Laser treatments are not painful and there is no lengthily downtime. A series of treatments, performed at 4 – 6-week intervals, are needed in order to achieve restoration of the skin, leaving your skin with a more even tone. It is also imperative to stress that lifestyle factors must be considered in the treatment program as well as the use of appropriate skin care products that both reduce the redness that exists and work with the laser treatments to control or reduce the condition.